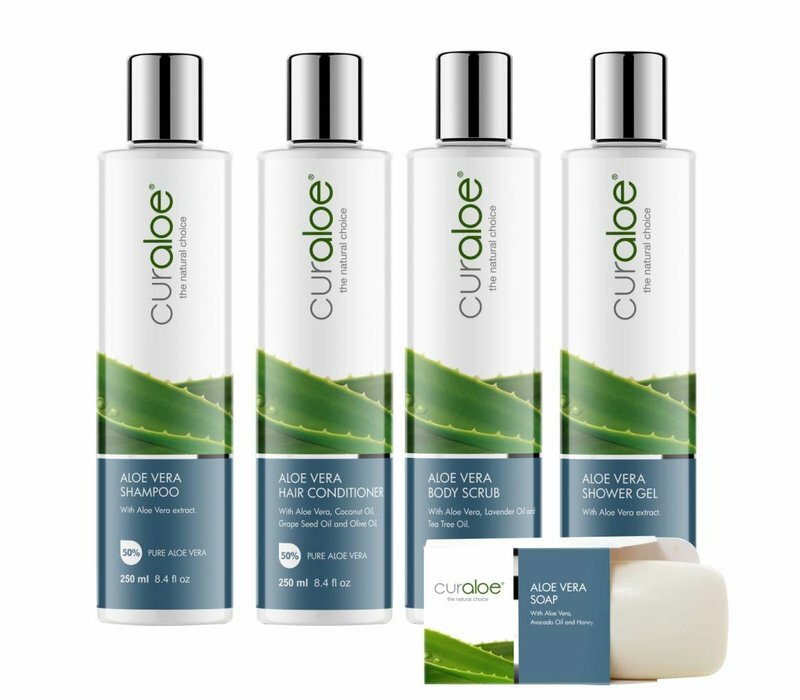 Curaloe® Shower Line Combo This combination package will suit all your shower needs. This is an combination of the total showerline collection. 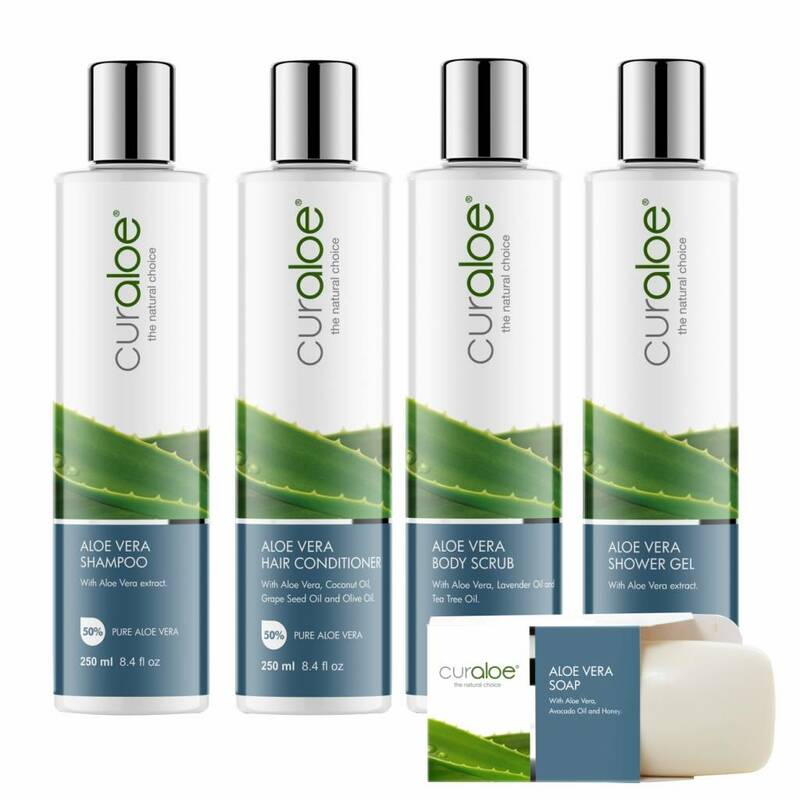 Curaloe® Shampoo gives your hair that shiny, manageable and natural healthy look. It cleans and moisturises your hair and helps to nourish and restore an optimal scalp condition while minimizing hair loss. ✓ Moisturises and nourishes the hair. ✓ Maintains healthy scalp condition. Curaloe® Conditioner is a fabulous hair and scalp moisturizer which makes your hair softer and shinier. Curaloe® Body Scrub effectively removes dead skin cells, leaving a radiant and smooth skin. ✓ Removes dead skin cells. ✓Smooths and softens the skin. Curaloe® Shower Gel is a unisex foaming gel which will nourish, soothe and clean your skin and keep it hydrated throughout the day. ✓ Nourishes and soothes the skin. Application: This product could be use on dry, sensitive skin. This is a product for personal hygiene. Apply to body and face and rinse off. Avoid contact with eyes. A very gentle and moisturizing soap without perfume. May be used for all skin types as an overall body and face cleansing soap. Use the soap with water to wash your hands, face or body. For all skin types. This package is a nice combination of all shower products. I bougt one for myself and one as a gift for a girlfriend. We conclude that we both enjoy using these products.